Do you like Arcane spellcasters? Do you like them when they are about 25mm tall, and they can be used in your D&D game? Well so do I, and especially so when they are free. Once again, I’m teaming up with the wonderful folks at Gator Games in this giveaway. All you have to do is leave a comment below, making sure you enter your email address, and you are automatically entered to win the 3 packs of minis. You can also send both @gatorgames and I a message on Twitter to enter, but you must include us both in the message. The contest will run until Saturday March 6th at 11:59pm eastern/8:59pm pacific. Once again, my apologies, but this contest is limited to the continental United States. I needs the minis, precious. I tend to DM, but when I play, I almost always go for an arcane character. Sweet! I’d love to get these! The group I DM for would be so happy to represented by something other than d6’s! Minis are excellent. Count me in. Sounds cool, count me in. My daughters would approve of these minis. Crap. Count me out. I’m not in the Continental United States. Funny how I was just saying today to a buddy that I’d like to get all the sets of the Players before they’re ‘gone’… This would help! Wow, I play several arcane characters. This would be great! Minis are nice. I like them. I CAN HAZ MOAR? When i am playing, which isn’t that often unfortunately, i also tend to play arcane characters. Can always use more minis. Sounds great! Please enter me in the giveaway. I DM more than I play, but they’ll work for NPCs as well as PCs. Alright, now I can take on that dragon’s lair. free minis sounds good to me…i’m about to play a warforged warlock! As a DM with many uses for such characters, both as NPCs and Villains, I greatly appreciate the opportunity to submit myself into this drawing. Thanks again to you and Gator Games for having these, they are always fun. Awesome! Those would be useful! I need to start my minis collection! I wouldn’t mind winning this. Ooh ooh, pick me! I DM, and kind of feel my PCs deserve better than to be quarters and buttons and suchlike…. I would like to be entered in your contest, please. I love minis, especially free minis! Hurray for the PHH minis! They will be missed. I would love some new minis please! My group could definitely use these guys as opposed to the ‘tokens’ some have been using as minis. good contest, simple and effective. A chance to win mini’s and a new source for out of print games. OH count me in! Definitely going to peruse Gator Games after work. Oh, and enter me in the contest if you please! Oh, Gator Games shall be visited with joy. It is really awesome that you all have coordinated this. Please enter me into the contest. Free minis for me please. Your site is a great resource btw. I’d like to win please! Yes, the winnings for me! I can always use more mini. The minis will be helpful in my game. March 6 is my birthday. Just so you know. Ooo, mini’s that aren’t little chunks of ugly wood, that sound’s excellent! I’m getting ready to run my first campaign for our group, minis would be awesome. Always need more minis. If the players can’t use them, having NPCs that aren’t random counters would be wonderful. I could really use these for my players. My kids will love them! I would love some minis! Just spent $50 on mini’s for a delve with my kid, these mini’s would help fill out the selection and the party. Need that yellow-robed wizard to match my red-robed wizard. This is great. My group has a small but growing minis collection, which is sadly light on the hero’s side of things. These would come in handy for my arcane power source only campaign. Sign me up! Please add me to the contest list! Thanks! I’m on this site daily, I’m faithful unlike these love them and leave them freeloaders!!! Free minis would be great, since the wife nixed my allowance on D&D this year…. stupid electric bill! Thanks for all the great contests. Count me in. I would like to join the contest too. Thanks. Please, please please, pick me! pick me! All your minis are belong to me. Please and thank you. Ooh! Ooh! I’m in! I love free stuff! I don’t always play D&D, but when I do, I prefer arcane spellcasters. I would love to win these minis..I’m a new player and am now totally addicted to collecting miniatures. The more minis the better! Especially since I just started a new wizard PC! “I’ll never win” is what I say when I really want to win. Ha-ha! You rock, Newbie DM! Neeeeeeeed more arcane mini’s for my Games! I would like to have these mini’s. Been reading your posts through the Network, keep up the good work. Wow, lots of entries here. But i’ll still throw my name in the hat as I always love new minis. Thanks for the opportunuity NDM! Really hoping I win this one. I could make a wizard school with these. Thanks for the contest. Minis… Did somebody sat minis!!!! I’m always ready for more minis (despite my wife’s belief that I have enough already… she doesn’t play so she has no idea how many minis is enough). I would love to have some more minis, thank you. Thanks for the chance – More minis please! To light our darkest hour. Till all are one! Minis! 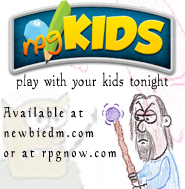 I think my son would get a kick out of these minis for our KidsRPG games. We haven’t introduced magic yet into the game and these would a cool excuse to do so. Can never have too many minis. Thank you Gator Games! a great day to find the site. consider yourself bookmarked. All your mini’s are belong to us. Who can pass up a chance for free minis? By the way, I appreciate your token tutorial. I’ve used it a couple of times so far, and it has gone over well. So what, LVL 1 PC’s were using LVL 30 at-will powers just because it didn’t say “1st-level”? I think the wording on that suited DM’s just fine. Everyone loves M-Us. Count me in! I already tweeted, but again, here. I’m the president of a non-profit organization that runs several gaming events. If my random number is drawn as the winner, I’m going to give the minis away to some of our event organizers to thank them for their hard work in the community. Specifically, I’m giving them to the two volunteers that are managing our weekly LFR nights, an event that’s grown from three players to five or six tables. They can use them as giveaway prizes at that event or just use them to reward the DMs that come out week after week to run events. And if I don’t win, well, I don’t win. Also already tweeted, but hey, it never hurts to double-dip, right? Building a wizardly enclave, these minis would be sweeeeeeet! Thanks for the tips. As a green DM myself I find them invaluable. Minis would be nice as well. Aww what the heck, sign me up. I can has a mini? Can always use more minis! cmon baby! i want these minis!! I’d love some spare minis for my group! Great blog, I’ve really enjoyed reading your thoughts here since I’ve gotten back into D&D myself, even drug the wife with. She loves playing. Cheers! Make it so. I need more minis. Thanks! Thanks for this and thanks to Gator Games as well! Please enter me in the contest. I have very few minis and am on a tight budget. I’d love to win some. Thanks for running all these awesome contests. I would love me some minis. I’ve been holding off of running any 4e campaigns due to lack of minis (and money for minis). Thanks for the lottery! I need these minis!!! I have five kids (all boys!!!) and they all play!!! I can’t even say that I deserve these…but maaan do I want them! Please!!!! i love to actually win something from here!! I think this is riggewd!! I love free minis. Especially since I am too poor to afford the not free ones. Neat contest. Hope I win. I ❤ miniatures. I would like more of them. I want the SET!!! I do have a continental us address for delivery so count me in!! Please enter me. A struggling DM trying to get his game on. Getting in under the wire here! The minis were in the mail on Monday and I got them yesterday. Thank you Newbie DM and Gator Games!